Castaway Paradise, Animal Crossing For iOS? A new title is coming to iOS later this year that feels strangely familiar, Castaway Paradise. Back in January of 2014 Nintendo released a statement saying that they would not be opening their games up for the mobile market, well other then Nintendo’s own handheld devices like the Nintendo DS. So unfortunately that means we won’t be seeing any of our favorite Nintendo games hit platforms like iOS or Android anytime soon, but that doesn’t mean that we won’t see plenty of look-alike’s. Castaway Paradise is a game developed by Stolen Couch Games and when they released the games trailer just awhile back, many saw some familiar gameplay and character models. The game strongly resembles that of Nintendo’s Animal Crossing, but it remains to have enough differences to setup the game apart as its own IP, well hopefully that is. The game takes place on a small island out in the ocean, the island’s population consists of animal-like people, and the texture style matches that of Animal Crossing almost exactly. The trailer doesn’t outright say a whole lot of what you do in the game, but if it’s going to resemble Animal Crossing which it appears to in every way, then I would think it’s safe to say you do whatever you want in the game. Whether it’s getting a cup of joe at the local coffee house or digging holes in your backyard, I’m sure we’ll find someway to get lost in this game. If you’re not familiar with the Animal Crossing series, it’s more or less a game where you go about doing every day kind of activities. It’s the type of genre that encourages more relaxing gameplay, rather then intense firefights or high-scores. There’s no doubt this type of game would be very welcomed on the iOS platform, as people are often looking for good games to help them kill some time on the bus to work or while waiting to be picked up at school. 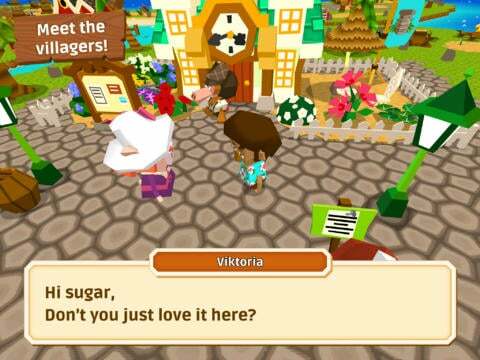 We can only hope that Nintendo doesn’t try to come down on Stolen Couch Games for creating something so similar to a Nintendo product, as it would only further discourage developers from trying to release more “Nintendo-Like” games on more mobile platforms. I can certainly understand the need to protect copyright material, but in today’s world, companies can often take things a bit too far. Castaway Paradise does not currently have a release date for the US yet, but the game has been alive and well in Canada since November of last year. If you haven’t noticed with other games yet, Canada is often a country developers will release a title as more of a soft-launch / beta. Most likely because they don’t except the same high numbers of sales there compared to other countries and because the culture is similar to that in the US, which gives the developer a good sense of how their game will do. Hopefully this extra time prior to the US release will ensure the game will launch without too many bugs or issues. Castaway Paradise is currently listed as a Free download in the iTunes store. Currently the game requires iOS 5.0 or later and roughly 70mb of space, though I would expect to see this change for the US release, most likely increases the required iOS version to 7.0 as they do with most games. Feel free to check out the links below to see it on iTunes or on Stolen Couch Games website. Let us know what you think of Castaway and if you’d like to see more Nintendo-Like games on mobile devices. You can also like our Facebook page, follow us on Twitter, and add us to your circles in Google+ to keep yourself up to date on all things mobile.